Regulate Qi and blood, regulate menstruation, stop leukorrhea. Beneficial to a woman’s general health and well-being. Supports the health of the immune system, helps restore alertness when experiencing occasional fatigue, aids in the relief of occasional sleeplessness, and helps to maintain a healthy appetite. Deficient Qi and blood syndrome which has caused leukorrhea, deficient Spleen Qi which may cause the body to fail to convert fluid, thus forming Dampness retention, which is the main cause for the production of leukorrhea. Thus, in addition to leukorrhea, signs of Dampness including aching in the lumbar area, abdominal distension, discharge, fatigue and poor appetite. Dysmenorrhea, menstrual cramps, irregular menstruation. Take 10 pills, once a day. Do not take if pregnant, in excess of recommended amounts, or in cases of spleen, stomach, or kidney deficiency. 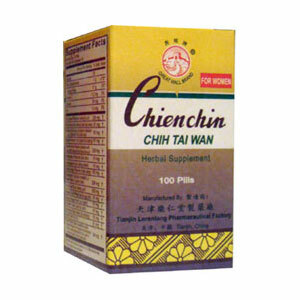 Not recommended in cases of headache, spleen or stomach deficiency or if in a weakened condition. Use with caution in cases of diarrhea or abdominal distention. Avoid prolonged exposure to sunlight.